I am happy to introduce to you Ansley Hall. Ansley joined our staff this Summer as the Weekday Preschool Director. 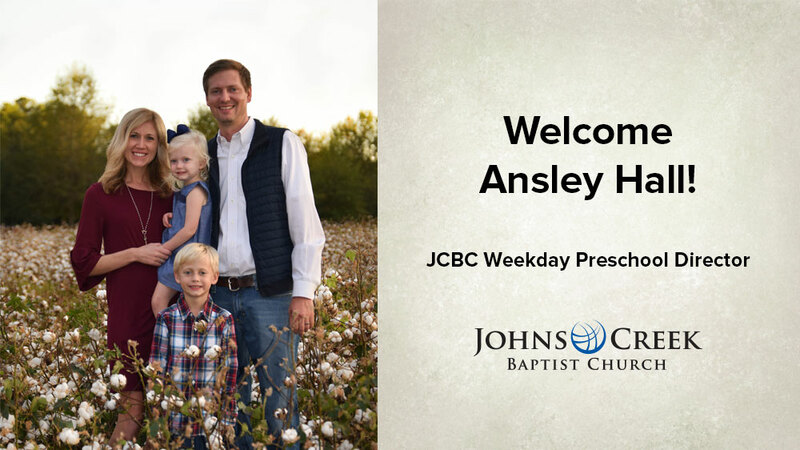 Ansley is originally from the Johns Creek area and recently moved back with her husband and two children after spending her college and early career years in Alabama. She has a master’s degree in education, many years of experience in both public schools and preschool, outstanding leadership and communication skills, a deep love for God and children, and comes highly recommended. I am confident that her professional and personal experience give her what it takes to lead our preschool effectively and believe she will continue to move our school in the right direction! She jumped right in working and planning our Summer Camps, with the help of some of our amazing teachers! She is already doing a great job preparing for the upcoming school year. I can already tell that she is a great addition to our team! Her heart for God, family, and education is evident in every conversation you have with her. I hope you will continue to keep Ansley and our Weekday Preschool in your thoughts and prayers. JCBC Preschool reaches so many amazing families and helps carry out our mission of forming children and families to follow Christ. I’m grateful for the wonderful opportunity to be the Preschool Director at Johns Creek Baptist Church. My prayer is that I will serve the church and preschool well for many years to come. I’m very excited about the upcoming school year and look forward to meeting all the families and students this August! Preschool is such a special time in a child’s life; they grow and learn so much in just a few short years. My goal as the new director is for every student to leave JCBC Preschool prepared for Kindergarten and knowing they are loved by God. Thank you for your continuous support and lifting us up in prayer as we start the new school year. GLAD TO HAVE YOU ABOARD……BEST WISHES. Discernment Retreat this Weekend - Johns Creek Baptist Church on Overwhelming Response to JCBC Shared Life Survey! So, What’s Next? Melba Franklin on Overwhelming Response to JCBC Shared Life Survey! So, What’s Next?